A National Investigation Agency team will visit Pakistan to further probe the terror attack on the Indian Air Force base in Punjab's Pathankot earlier this year, the central agency announced on Friday. "We told them we want to send a team to Pakistan. They have welcomed the idea," NIA Director General Sharad Kumar said. The NIA visit to the neighbouring country follows a similar exercise by Pakistan's Joint Investigation Team, which visited Pathankot earlier this week to probe the attack on the IAF base in which seven security personnel were killed. The Pakistani JIT on Friday concluded its six-day discussions with the NIA on the probe into the Pathankot terror attack even as the visiting officials recorded statements of witnesses and collected DNA report of slain terrorists. On the proposal for an NIA team's visit to Pakistan, the JIT has welcomed it, saying mutually convenient dates will be worked out. The team was given a detailed presentation on the probe conducted so far and it was taken to the crime scene in Pathankot. It has also been handed over some more documents which included DNA report of the four terrorists killed in the 80-hour gun battle with security forces. The Pakistani team, headed by Additional Inspector General of Police, Counter Terrorism Department, Muhammad Tahir Rai and including Inter-Services Intelligence's Lt Col Tanvir Ahmed, began their day by recording the statements of witnesses in the case, National Investigation Agency sources said. The team arrived in India on March 27. They recorded statements of 16 witnesses, including Superintendent of Police-rank officer of Punjab Salwinder Singh, his jeweller-friend Rajesh Verma and cook Madan Gopal. 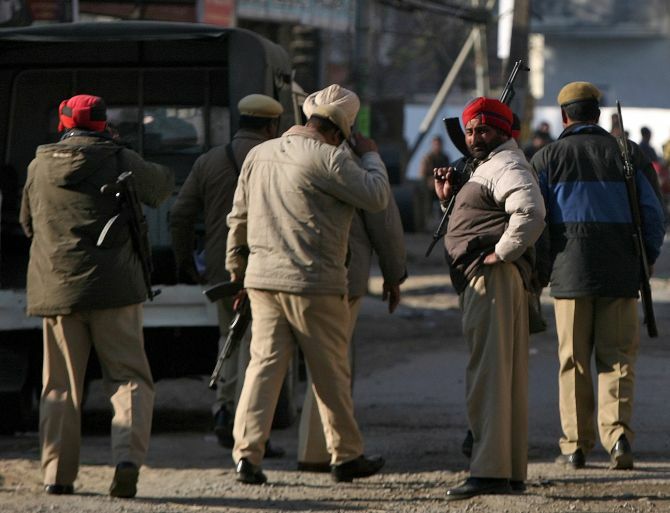 The three were kidnapped by the Pathankot attack perpetrators belonging to the banned Pakistan-based Jaish-e-Mohammed on the intervening night of December 31 and January 1. The Pakistani JIT had asked NIA to hand over swabs of the four terrorists, identified as Nasir Hussain (Punjab province), Abu Bakar (Gujranwala) and Umar Farooq and Abdul Qayum (both from Sindh). However, the Indian anti-terror probe agency handed over to the visitors the DNA report of the terrorists and asked them to match those with their family members, the NIA sources said. Besides recording the statement of the three, the JIT also spoke to the caretaker of a shrine visited by Singh before he was kidnapped, policemen and residents who spotted the vehicle of the police officer after it was abandoned by the attackers. Statements of doctors who conducted the post-mortem on the bodies were also recorded. The JIT, which arrived in Pathankot on March 27, interacted on the case with NIA officials which included a visit to the IAF base where they were shown the scene of crime as well as the location from where the terrorists sneaked in and hid. They also visited the spot where Ikagar Singh's vehicle was snatched, where he was murdered, and the spot from where the terrorists hijacked the SUV of SP Salwinder Singh, Kumar said, adding the route taken by the terrorists was also shown to the JIT. "These are part of the standard legal procedure of investigation followed in both nations," he said. On JIT's request, the NIA provided certified copies of postmortem reports, call data record, DNA reports of four terrorists and the seizure memo of articles from the scene of crime. The Pakistan JIT was given access to 16 witnesses including Salwinder Singh, his cook, Rajesh Verma and some witnesses as per agreed terms of reference and extant legal provisions. "The JIT informed us that they were collecting admissible evidence outside Pakistan under the provision of Section 188 of the CrPC of Pakistan, that will legally enable them to be used in prosecution," he said. JIT was also requested to verify the various articles seized from the terrorists including arms and ammunition as mentioned in the Letters Rogatory sent earlier to Pakistan. The NIA shared with JIT the identity and the address of the 4 terrorists and requested that the JIT confirm the same. Amitabh Bachchan for President? No way!